This is the sort of investigational piece that no filmmaker would dare to tackle today for fear of alienating the popular ticket-buying audience: young men and families. In 1968, the notion of a film about ancient Greek women, starring three Swedish actresses, made by a neophyte female director who skipped out on her acting contract with a major Hollywood studio would have likely resulted in guffaws from the men in charge of making movies stateside. Now, some 40 years later, that response might still happen: you just don't see many "female" dominated films doing major business. Thankfully, director Mai Zetterling (who also enjoyed a successful acting career -- you may remember her as the grandmother from Nicolas Roeg's The Witches) was able to pull off the impossible: The Girls (or "Flickorna", in Swedish) is a subversive film exploration of women that was made in the infancy of a cinematic movement that finally began to allow women to function onscreen in a realistic way, rather than like the glamorous Hollywood idea of "womanhood" that usually involved grueling hours in a make up chair. Surely at the time no American studio would have offered up a dime for such an offbeat film to be made, so thankfully the more forward thinking film financiers of Sweden stepped in to intervene. 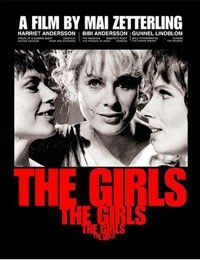 The Girls' true daring lies in it's revolutionary casting: the film brings together three legendary Swedish actresses: Bibi Andersson, Harriet Anderrson and Gunnel Lindblom (each of whom was directed to greatness at least once by master director Ingmar Bergman). While the premise is routine (the trio is rehearsing for a tour of the classic Greek comedy Lysistrata), Zetterling focuses the action not on Aristophanes' play, but on the women themselves, providing a thoughtful, playful rumination on femininity, theater, and performance. Clearly intended as a showcase for its principles rather than as a blockbuster, the film celebrates the behind the scenes drama of putting on a show and isn't afraid to tackle the issue of women sabotaging other women. While the themes of the play and the film may have been inflammatory for their time, the film itself shows its age: there are a lot of quasi-artsy voice-overs that try and transpose the language of the play with "insightful" commentary about the inner-workings of the minds of women ("Women, what a hopeless lot we are" is not used in the humorous context in which it's author intended, but as a semi-offensive comment on modern women).This device comes across as gratingly self-serious as well as amateurish despite the gameness of the players. Though the film may not hold up as a pillar of serious feminist filmmaking history, it must be given credit for even being made, considering the climate towards women in film at the time. Each of the actresses conveys the relevance of the ancient stage play's comedic themes, contrasting their contemporary character's more dramatic lives nicely. Bibi Andersson's blond, statuesque Liz is the classic lonely star whose husband (Swedish film vet Erland Josephson, adding another dimension of Bergman-esque glow to the proceedings) can't wait for her to go on tour so he can sleep around. Marianne (the other Andersson -- Harriet, who may, in fact, be the world's most beautiful woman) is a single mother who tries to revel in life's simple pleasures, meanwhile, concentrating on building her character in the company of her screaming toddler, something fellow mom Gunilla (Lindblom, who is not really given anything interesting to do, but is nonetheless game) also struggles to cope with as she prepares to hit the road. It is made clear that these women are unhappy with their respective stations in life but they do little to address the changes that could be made. Liz is the only one who takes matters into her own hands, exasperatedly scolding a crowd after a performance ("Don't you understand that it's we who make the world what it is?"). As their stage characters swear off interaction with all men, taking an oath of frigidity, the actresses each flashback to the dastardly men in their personal lives with disdain. The juxtaposition of the play and the women's messy personal lives gets tiresome quite fast. While the actual look of the film is crisp and unfettered, the action is beleaguered by the clunky, antiquated script and lack of focus. Is the film about women's role in comedy? Or is it about women's place in war? Is it a simple reflection on the war of the sexes? There is no clear definition, just a host of arty montages that try meagerly to pass for commentary, including one scene featuring the entire female cast taking part in a rather gratuitous strip tease, which seems more tawdry than liberating. The most spirited interactions between the actresses are captured, curiously, on the documentary that accompanies the film. Lines From the Heart is a 73 minute documentary made in 1996 by Christina Olofson. It reunites the three stars of The Girls to talk about the film's production and what it meant to make the film at the time. The reunion is dedicated to Zetterling, who died two years prior to the filming at her estate in the south of France. The performers dish on sadistic directors, cry about making choices to have careers rather than children, and even sing "Mona Lisa". It is an unusual, provocative supplement to the movie, given the small scope of the original project. It is rare and glorious to see these icons of world cinema reunited for a wonderfully frank talk on the art of acting and their experiences as working women in the medium of film ("We learned a lot of useless things at drama school", Lindblom cracks to the her two laughing pals as they sip wine in the afternoon). They talk at length about Zetterling's directorial career and her bitterness over not being able to make the films she truly wanted to, though the women acknowledge it was easier for her to get her films made in Sweden (and Europe in general). This is a rare case of the film's extras being more engaging that the actual film: each of the women taking part in the discussion having sustained a reasonably successful international acting career for many years. Take for example Harriet Andersson, who talks about everything from her inauspicious beginnings as an elevator operator to nearly being killed by a horse in front of 1,000 extras on a film set. She has enjoyed a 60-year-long film career that began in the early '50s with Bergman's Summer with Monika and landed her in the recent Lars Von Trier opus Dogville, though the veteran still claims in humble good humor that "sometimes I wonder whether I've been a fake all my life". Aspiring performers should take note of such luminaries' bold candor as well as their career moves, even when they are missteps like The Girls. The film, despite some gigantic blunders, does offer up an often entertaining, often confrontational look at the role of women in film at the time. This is the sort of investigational piece that no filmmaker would dare to tackle today for fear of alienating the popular ticket-buying audience: young men and families. The only thing The Girls really does effectively is make one long for the day when such feminine cinematic experiments were both popular and permitted.